When I said this, I was largely referring to a facet of Mario Kart’s design that always prevents my enjoyment of the games: the lack of a curated race campaign and any sense of progression. Somehow, I’ve just never managed to accept the idea of Mario Kart being a “party game” and continue to treat it more like a traditional racer—to the detriment of my enjoyment of it. Humour me for a second, though. As a racing game, Mario Kart’s main issue is this: the game may have anywhere between 16 to 32 tracks, but it only takes a couple of hours to unlock every track and see everything there is to see. Once you’ve done that, all that’s left to do is play these tracks on higher difficulties over and over again, or in multiplayer. There’s no real sense of the game making an effort to curate its content in interesting ways and spread it out for the player to gradually unlock and discover over time. In other words, there’s no “campaign”. 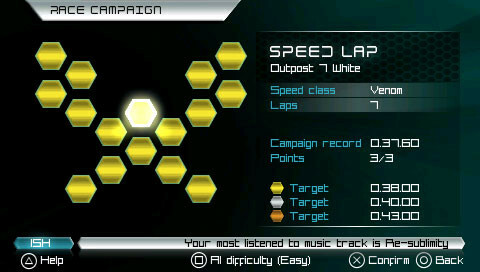 In contrast to Mario Kart, we have another game from a series that it inspired: 2007’s Wipeout Pulse on the PSP. Despite being Wipeout’s first attempt at it, Wipeout Pulse has one of the most well-thought-out race campaigns ever. It’s broken up into various events such as Single Races, Tournaments (which consist of 2-3 races), Eliminator (deathmatch races), Head-to-Heads (one-on-one races), Zones, and Time Trials. The game spreads these events out over just 12 tracks, each with a regular and mirrored version. Pulse also has speed classes similar to Mario Kart: Venom, Flash, Rapier, and Phantom. Now, 12 tracks and four speed classes isn’t a whole lot but Wipeout Pulse’s race campaign does a phenomenal job of making the most of its limited content using the smartly designed race campaign grid you see above. Each cell on the grid is a different kind of event (Zone, Eliminator, and so on). The trick here isn’t that there are a lot of tracks, but that each track can be used in several different ways, across different events, across different speed classes. This is what gives Wipeout Pulse its longevity and ability to keep the player coming back for more—the need to “check off” every event on the grid . While Pulse is fairly old, other newer games such as Forza 7 use similar ideas to keep their players engaged, too. Judging by how well the games already do, Mario Kart obviously doesn’t need to worry about player-retention. Unlike me, most people seem to understand the idea of Mario Kart as a party game, and enjoy it on its own terms. The problem is, Mario Kart is now headed to smartphones, where it won’t have that same luxury. On smartphones, where it can’t be a party game and will inevitably have to be more of a free-to-play racer to gain any real traction, it absolutely will have to deal with the concepts of player-retention, daily active users, paid conversions, and all that other business-y stuff that make smartphone games tick. As of this article, we know next to nothing about Mario Kart Tour, announced by Nintendo president Tatsumi Kimishima several weeks ago. All we know know is that it’s coming sometime before March 31st, 2019. That having been said, we can engage in some educated speculation. To be more precise, we can safely assume that the structure that works for Mario Kart on consoles isn’t going to work on smartphones, and that Nintendo will attempt to address this in some manner—the potential is simply too large in the smartphone racer market for them to risk botching their shot at it. Need for Speed: No Limits, for example, has somewhere between 50 million - 100 million installs on Android devices alone. Another Electronic Arts game, Real Racing 3, has between 100 million - 500 million installs. Meanwhile, Gameloft’s Asphalt 8 is equally popular with 300 million downloads overall. 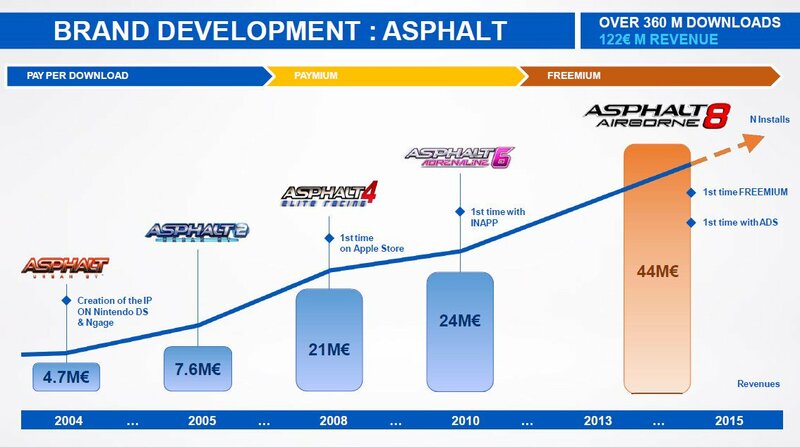 In mid-2016, Gameloft reported they had made approximately 44 million Euros (that’s about $54 million) from Asphalt 8 alone. Now, imagine what a brand as well known as Mario Kart could do in that space. Now obviously, there’s a lot more to the loop than that. You often have to contend with fuel/energy timers that limit how much you can play for free without having to shell out some form of currency (usually the hard variety). 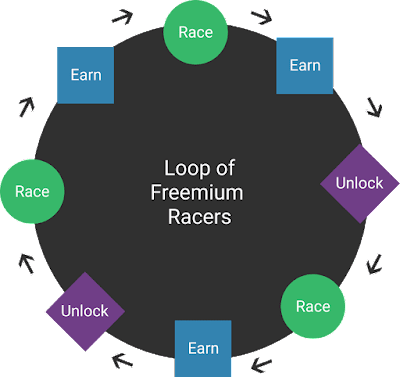 You have to contend with constantly juggling whether you want to spend your hard currency on playing more or conserving it to unlock new cars. You have to contend with gaccha mechanics that make obtaining car upgrade parts difficult and excessive grinding necessary. Once you have a fancy new car, you have to decide whether to keep upgrading the older ones which you’ve already invested hours of effort into, or start over from scratch to bulk up your newer, fancier rides. To sum it up, it can get really meta. And that’s part of the charm, so to speak. Here’s the thing: this gameplay loop isn’t all that different from a regular racing game on consoles. 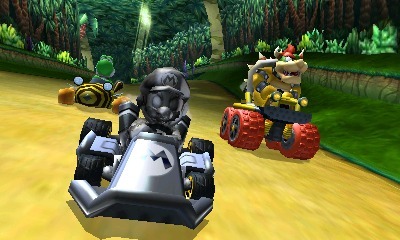 Despite the overly complex metagame, the excessive use of gaccha mechanics, the constant ads and reminders that you can pay real money to save yourself hours of grinding, successful free-to-play racing games do tend to have a fairly well-thought-out gameplay loop, and a great sense of curation and progression—ironically, the one thing Mario Kart is known for not having and is in need of. Now, we don’t necessarily want Mario Kart Tour to be as grindy or as gaccha-driven as Need for Speed: No Limits or late-game Asphalt 8, but a smartphone version of Mario Kart would need to involve a gameplay loop purely out of necessity—because without one, there’s no room for monetization. And by extension of having a gameplay loop, the game would also be required to curate its tracks and events in a way that keeps people playing. In other words, it would require a proper race campaign of some sort. This is easier said than done. 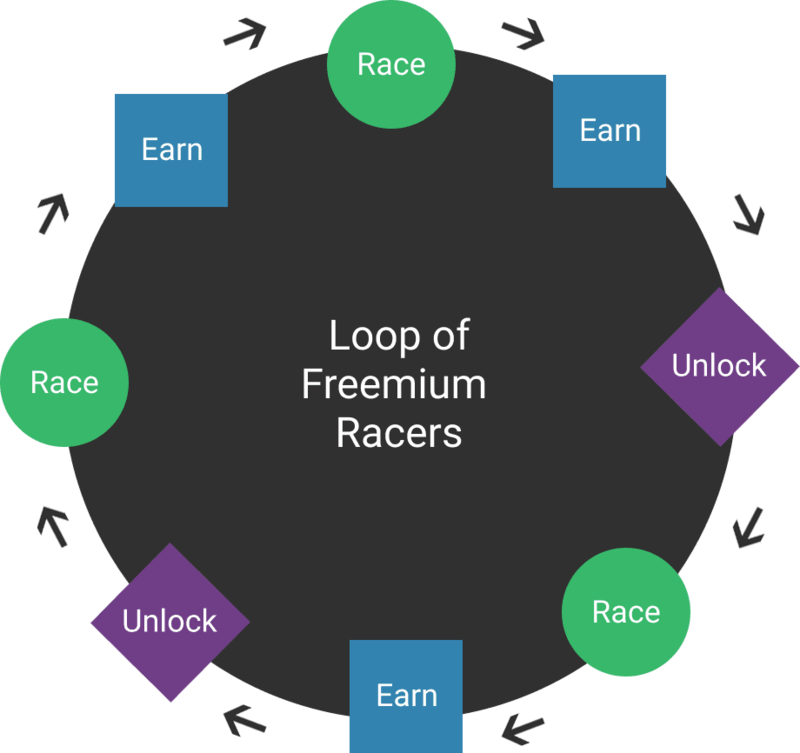 One of the things free-to-play racing games use to keep players engaged is the idea of constantly unlocking better and fancier cars, and gate progress behind these cars. This works best when your cars are sleek and stylish, and even better if they’re licensed real-life cars like in Need for Speed: No Limits. After all, who doesn’t want the new Lamborghini or a McLaren? Mario Kart’s karts, however, are neither sleek, nor stylish. Because of this, they aren’t really going to serve as an effective means of keeping players engaged through the allure of unlocking them. This means that either Nintendo will need to redesign them so that they can serve this purpose (which is unlikely), or find another solution to create a structure of progression and player-retention. I mentioned Wipeout Pulse earlier. That game relies almost solely on the idea of unlocking more tracks and events to keep the player engaged, without relying on cars. Perhaps that’s the route Mario Kart Tour needs to take as well. Either way, I’m very curious to see just what Mario Kart Tour ends up being, and how far down the F2P racing metagame rabbit hole Nintendo are willing to go. Will it be a traditional racer like Need for Speed and Asphalt? That would be the logical choice, since those are the smartphone racers that tend to do really well. Alternatively, it could end up being a management game, or one of those gear-shifting games. Beyond that, I’m even more curious as to whether this could positively inform the design of the console Mario Kart series in the future. 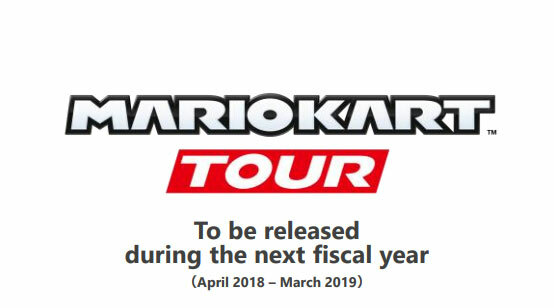 If that ends up being the case, Mario Kart Tour will be important beyond just Nintendo’s smartphone initiative as something that actually feeds back into their console business. Asphalt revenue slide courtesy of Gameloft.